Janet Reid, Literary Agent: Querying? Clean up your web presence! Querying? Clean up your web presence! I recently taught a class in Effective Query Letters at CrimeBake. You'll notice item #10: Correct form for email querying. Your contact info is at the bottom. List ONLY the ones you want an agent to see. And before you send your first query, take a look at your blog, your website, your Facebook page and/or your Twitter feed to see what an agent skulking around will see. Posting your rejections with comments? Not a good idea. Posting your anguished rants on the vagaries of the publishing industry? Not a good idea. Posting your work? Do you want me to read it? I will if it's there. The other thing you'd be VERY smart to do is have another set of eyes take a look. If you've got spelling errors and homonyms, run on sentences or sentences that don't make sense, you want to edit those BEFORE I get your query. Even the most careful writer will find errant words and phrases have crept in to their online writing. And it never hurts to post a picture of your pet. Am I the only one going into the office today? I would be curious to know what author blogs/websites fellow commenters enjoy when they're not here, what websites they feel are particularly well done, etc. It's always helpful to check out examples. Any suggestions? Gosh, that's an awful lot of ways to stalk - I mean contact - a potential client. These days it seems so easy to damn yourself by your online presence, for anything from job interviews to dating, but thankfully mine is kept to a minimum. I still don't understand the point of twitter. My facebook page is purely for keeping in contact with my reenactment buddies across the world, and posting pictures of bunnies (I guess that fulfills the pet picture requirements anyway). I can't be bothered to maintain a website and I don't find my daily ramblings interesting enough to warrant a blog. That leaves my email address and phone number. Is that terribly old fashioned and out of touch these days? Typos? Did you say clean up the typos. Oh my word. I might as well erase my entire blog. Luckily I've mostly used my blog, Twitter and FB for professional motives. In a need for secrecy I don't post book reviews. Maybe I'm paranoid, but I have reasons. Before reading this post I thought cleaning up my web presence might mean eliminating my Goodreads account or anything else I don't want to be known for. Thank you for the link to the Effective Query Letters class notes. Bookmarked it! Printed the hand out. Looking forward to using it. Soon as I figure out how to end my book. I best go and clean up my website. I have the first chapter of book two up and that was three revisions ago. Nowhere near what it is now. And what it is now may not be what it will be. Lucie, I am in my writing office (located by fireplace in my little cubby of a home) but I am forever lurking here on the blog. I do contract work at a school system so we are out for week. Yippie! I blogged about my dog this morning just because of this post. I have been woefully neglectful of my blog lately so naturally I had to rescue a pup. That makes some kind of sense somewhere I suppose. I am geering up for query round 2 so I suppose I must at least seem to be present. I don't do Facebook. I use Twitter mostly for posting pictures of beautiful landscapes and intriguing animals. And for stalking favorite writers and keeping an eye on agents. Why won't Brandon Sanderson, Neil Gaimon or Patrick Rothfuss follow me? I am just going to have to win a Hugo I suppose. That can't be harder than winning one of Janet's flash fiction contests, can it? Pets? Should I rent one, or can I put a photo of my cactus instead? And, Google your name. God only knows how many criminals might share your name. That link to the query handout is wonderful. My mistakes my first round were not enormous, but they were significant enough (the overlong first sentence was my big crime). I feel so much better prepared for querying my next book (even if it's probably a still a year away from starting). Also, this post is the motivation I needed to make my website go live. I understand the grumblings above, "can't be bothered" to make a site, but I bought the space, and I'm going to use it. I might not have much there, but it will exist. I think the purpose is just to increase your own findability. Give the agents another way to find you and your work, even if it requires a little effort. But the hypocrite in me says, "It's almost bedtime. I will do this Friday." >>But you don't need ALL of them. >>List ONLY the ones you want an agent to see. But - I put down a bunch of towels and am leaving it for my husband to figure out. I have to be in court today. As for online presence--I'm pretty proud of mine. For better or for worse, it's a representation of who I am. Not all of who I am, of course, but a good starting point. I've spent nine years writing about my personal life/development on my blog(s). It's offered me a lot of opportunities that I probably wouldn't have had otherwise, but, more than that, it's been a creative outlet and a way to connect to other people in a way that I crave. Sometimes the world screams so loudly, it's hard to think you have a voice. At least, in this little corner of the internet, I can share mine. That said, I'm careful about what I post. While I often write about the hard, emotional stuff because that's how I communicate and connect with people, there are subjects that I consider off-limits, both on the blog and other social media platforms. I won't talk about politics, as much as I like to read and want to, because the internet likes to troll and not respectfully debate, and I don't have the time or energy for that crap. I've even scaled back in talking about my personal life in recent years (family and friends were always off-limits) because I'm valuing privacy now. So...part of me, but not all of me. I think that's where I was going with all of this. I have pictures of my muttfaces on my blog, too. That's probably the most important thing. Dena: Oh no! I hope it's an easy fix/clean-up! So much for having a fairly unique name. Slush Pile Hell and obviously Janet's blogs are always must-reads, but other than those, my main online addictions are The Arrant Pedant, Caustic Cover Critic, and The History Blog. I follow many blogs of our community and others, but these are the most effective blogs that aren't in any way about their authors. Only The HB posts every day, but all three are my runaway favorite reads when there's new content. The Arrant Pedant shares with Miss Manners one of the most breathtaking talents for the polite and intelligent takedown of presumptions I have ever seen. Gorgeous, every time. But seriously, folks ... I actually do try to pay attention to what goes up on my blog in particular and my Twitter more loosely. Even if I'm not querying, and even if my content is imperfect as a platform, I follow a rule with anything, including my comments here and elsewhere, that my mom, nieces, or coworkers should be able to read/see anything I put up without embarrassment. (Okay, my nieces might be chagrined at what a dork I am, but there is no reputational risk to them in anything I do online.) 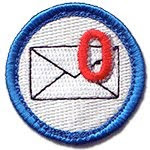 And NO PII (personally identifiable information). I don't post pics of my family, I don't use names of people I know as a rule, I don't discuss relationships without permission. As a writer, I'm a cannibal looking for characters (and stay tuned for that post, too, it's on the way), BUT I am not ready for litigation. I've used Google Alerts on my name for years, but its algorithms tend to result in an awful lot of info about what Diane Krueger is wearing, and the occasional nod to Diane Sawyer - when I get an alert at all. Le Sigh. Dena, I hope all will be well and you will have a blessit Thanksgiving after all. "But you don't need ALL of them." Take this to heart with social media, too. You don't have to do EVERYTHING, but adopting a Luddite sensibility toward all of it means you're choosing to let the world move on without you. When I started my graphic design career, I learned on pasteboard (this was back in BC, before computers). A few days ago, I got the textbook for the web design class I'll be teaching next semester. Things change. This is not a bad thing, unless you drag your feet and insist on never learning anything new. Contrary to the saying, old dogs can learn new tricks, and even if you don't think so, you really are at least a smart as a dog. LynnRodz: Put a jaunty hat on that cactus and post away! Good luck, Dena. I hope it's a simple fix. Diane, re Google Alerts: It's been a while since I've looked at them, but I'm pretty sure it's possible to remove certain terms. Could you include -Sawyer or -Krueger or even -"Diane Sawyer" or -"Diane Kruger" in your search terms? I do a Google search for BJ Muntain once in awhile. Just checked again - the first 3 pages are all me. After that, there's a couple other Muntains amongst the BJs, and after awhile, you start getting all the typos for 'mountain'... But wow. There's a lot more about me out there now than there used to be. Whoa! I got mentioned on Gary Corby's blog in 2009 - not sure I saw that way back when! It is still all about the writing. Knock the socks off of an agent and make them spew enough coffee to ruin a keyboard and they will not bother to check your web presence. There is also that attraction to asshats that sometimes creates a more rabid fan base. So it may not be necessary to clean your online persona to a squeaky clean. Personally I am still contemplating the web presence for this part of my world. I will admit that I seriously doubt that I will write a query as well as Donna's favorite but when I get close it should be enough. Should I tie the different parts of me together in an online presence or should the writing part me separate? It is time to go back to baking pies. Too bad the weather here is too hot and humid to get a good crust. If you end up in Florida do not plan on making fudge, divinity or pie crusts. Craig: I wrestled for a while with the idea of splitting my interests out into separate blogs, and strategically advertising my blogs to those I thought would be interested parties (e.g., a writing blog for agents and writers, a theology blog for church friends and theologians, etc.). In the end, I decided against this. As I trolled the net looking at agent and author blogs, I found myself drawn more to those that gave me a good picture of the person. I like that Janet doesn't just talk agent-y stuff, but will sometimes talk about painting projects, movies, and other life events. I want my blog to be a snapshot of me, and not just a sales pitch for my work. As such, I will post about things that interest me: writing, books, theology, music, Doctor Who. And hopefully, I write about them in a way that shows agents at least a modicum of writing ability that hopefully finds its way into my fiction. And don't forget, if you're looking for fellow woodland creature blogs to follow, check out the List of Blog Readers and Their Blogs. If you're not on the list and would like to be, drop me an e-mail (my address is in my Blogger profile). No political statements/commentary/viewpoints on my FB, Blog or Twitter. Matter of fact I wrote a blog about that a while back titled "White Noise." (referencing a tv's static off the air screen that used to happen at 12:00 a.m. for all you youngsters) It's not relative to what I write, and honestly, who gives a hoot what I think? Half the time even I don't care what I think. No excerpts of the work, b/c half the time I feel they aren't ready. That could change in the future if I'm "told" to post for marketing reasons. I'm safe on all other counts. "Half the time," on the brain. Okay, after reading a post like this and a link like THAT (! ), it's still not proper to send a bottle of top shelf to FinePrint? Holy ravioli, this is great stuff. Thank you x a million, Janet. Yes, I appreciate all the hints on that page. All in one place. That polar bear: impressively HUGE. He looks like he would not be able to fit into the narrow doors of the train. I understand why the underground has NO people. I wouldn't be there either with a wild polar bear loose. Wonder what the aboveground looked like as everyone poured out of the exits? Dena: I hope your husband gets that flooding problem resolved. That's a discouraging note the day before Thanksgiving. DLM and BJMuntain: I agree. It is fun to google your name and see what comes up. I found out recently that my name was listed in someone else's book, for sale on Amazon, because of my connection to another person they were writing about. Shouldn't they have asked me first? It wasn't a bad mention but I was a bit startled. Craig: Whether to tie your personal and professional lives together online is a personal decision, not a professional one. Do you want your personal life to be public? Some do. Some don't. And that's why it's a personal decision. I try to keep most of my online presence professional, though I sometimes get personal on Twitter. Not "Look what I had for breakfast" personal, but chatting with people, interacting, sharing information, and yes, sharing myself when the situation calls for it. I do have a Facebook fan page (they call them 'author' pages now, but they were originally 'fan' pages), but I don't put that in my contact information, either. I don't have a lot of faith in fan pages anymore - Facebook has made them nearly useless - so I haven't been putting a lot of effort into it. Although I did put my Twitter short story on there (it can also be seen on my website, though). - The genre isn't selling as well as they'd like. - They already represent a fair number of authors who write your genre. - Their stable is getting full, so they're being very picky about who they choose to represent now. Great writing is wonderful, but after getting a few rejections saying, "I love this so much - but the genre is a tough sell these days", you'll want to do everything you can to push them over to "I love this so much - I'll work harder to sell it". And sometimes that requires more than great writing. While I'm sure it's great advice: spelling, comprehensible sentences, it's all just so prosaic. I'm more of a mind for looking for that edge when considering a website to promote oneself. Perhaps the sympathy vote might supply it, you know the kind of thing. 'Will we be able to eat food from a tin that doesn't have a picture of a dog on it soon mummy?'. 'Sorry Johnny, how about some Kitty Chunks for a change?'. ...well at least they're all recovered from rickets now. What do ya think, got potential? Lucie, I really love Jenny Crusie's blog, Argh Ink. DLM has some great suggestions too--some I know already and some I'm going to check out now. Thanks! I also like to spend time on my blog, but lately it's been a struggle (who knew having a baby was so time-consuming?? Okay, everyone. Everyone knew that). No pets, because of my allergies, but I do have an Instagram full of baby pictures! A (childless) friend of mine did recently say that she likes my baby because "He's like cat... only he can smile!" Question, Lynn, how do you pet a cactus? Happy turkey day fellow Pilgrims and regarding your queries, stuff 'em. (Tomorrow only). Then it's all Reiders back to Janet's Planet. For all of you folks around the world who do not celebrate our holiday of thanks and gastronomic overdo, have a nice day. Colin, You have a fantastic blog. Someone asked for an example. 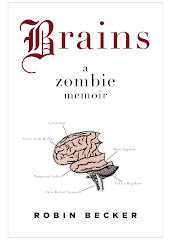 I have self-published two shorter books, but I am considering sending out query letters for different novel. Is it going to hurt my chances of finding an agent when they see that I am promoting my self-published books? I'm not too concerned about my web presence. I should go back and edit through some old blog posts to make sure they are as clean as they can be. My son wants me to change my site to a more modern looking one. He hates the busy background and thinks I should have more interactive stuff. The main problem with it is I need to use it more and do blog posts more often. I wish I'd just stayed with blogger and blogged. The site regularly has stuff that needs to be updated and fixed. If an agent stalks me they will find the writer, a university professor in Stillwater, OK (the last place I lived, which made things interesting when picking up prescriptions or making dr. appts. ), the vice moderator for a church in NC., and a lovely, young, nearly naked lady with long, brown hair. I think I would make a good moderator of vice. Pet pictures are usually horses I've owned unless you include my collection of Wrangler patches. I have a nice assortment of those. Do cowboy posteriors count as pets? They should. Thank you, Janet, for posting the link. If I don't see you all before Thanksgiving, a very happy one to you. It's obvious I've been hanging around here too much. I was looking at a set of alphabet refrigerator magnets. They had spelled out, "Your dinner is in the fridge." At first glance, I thought it said, "Your daughter is in the fridge." My second thought after seeing that was, "hmmm, a writer must have arranged those letters." I have been trying to decide what to do with my blog—if I want to continue it or not, and if not, what to replace it with. It is challenging coming up with content for it—I tried doing an every-day thing and I couldn't keep up with the pace. I don't know how Janet does it. I got burned out pretty quickly. I tried Googling myself. I don't know if it's because I was logged in to Google or not, but I got a bunch of pictures of my friends, plus some really random stuff. And my Twitter account took up a good portion of it. Glad there's no axe murderers with my name out there. Today I was asked to select pictures of palm trees. Given that I'm about to spend the next 36 hours outside in the rain and cold, that's just cruel. 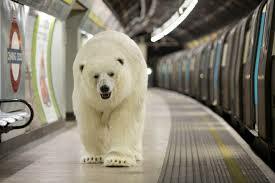 I know I'm not on any other blog, but I would really be tempted to wonder, could that polar bear in the Underground be a prompt for a flash fiction contest? It couldn't, could it? No, I really didn't think so. Are there tame polar bears? Lucie—I'm at work, too, and I'll work Friday. It's fairly voluntary; I'm in sales, and business needs a boost. More than that, my boss was very generous with time off around my wedding, so I'm working minor federal holidays and semi-traditional-days-off until the end of the year as a thank-you. Julie—if you're married, your spouse may have something to say about you petting cowboy posteriors. Also, I think your site's down. Janet, thank you for this GOLDEN advice on writing query letters. I reviewed your handout (lucky Crime Bake attendees) and have saved it for when I'm ready to query. In the meantime, it's a relief to know that what folks like Donnaeve and Colin recommend about websites/social media is what I'm already doing. I avoid mentioning politics and try to openly communicate about my passions, which happen to be writing and reading. I'm single, praise God. So, I can admire all the Wrangler patches I want. I think my site is still up. Wrangler patches. DeadSpiderEye - too funny! I'd ask for the full! Happy Thanksgiving to all and especially to you, Janet Reid, for your wonderful blog the same sense of integrity that permeates the book you recommended, Susan Rabiner's Thinking Like Your Editor. The book makes me thrilled to be writing non-fiction - and happy to know that the way I want to write is what the editor wants to see, i.e. writing that makes sense and moves the reader along. Great book! (And I will add no puns about "now we're talking turkey!") Thank you for the recommendation. Have a stellar Thanksgiving! Thanks for some of the recs! And a very Happy Thanksgiving to all of you. I don't speak web, which for some seems to be a derivative of text messaging, so, unless something slips through, I don't need to chase after my social media with a pooper scooper. And, since I'm allergic to all fur bearing creatures, I mean really allergic, I have no pets. (Just another reason not to need a pooper scooper.) However, would pictures the free range deer, including lovely photos of the cutest fawns—the ones that keep my lawn moved—be sufficient? Dena, I would show you a photo of my cactus, it's as cute as any pet...well almost, but I'm not sure it belongs here on Janet's blog. Jenz, I may very well put a little Santa hat on it for the holidays. Thanks for the idea. 2Ns, my hubby suggested I put a photo of him instead of the cactus with the caption, "He may not be my pet, but sometimes he's my pest. Does that count?" LOL. Okay, I'm off to bed. A Happy Thanksgiving to Janet and all her fellow Reiders who will be celebrating tomorrow! Thanks for all the well wishes. My kitchen floor turned out to be -- the reservoir of my water filter thingy overflowed. I realize that's a highly scientific definition. Sorry. Anyway, messy but not major, thankfully. I want to pet the pet!! I'm planning to spend the next several days mostly offline to get some writing done (someone's got to do it), so Happy Thanksgiving to those who celebrate, and happy Thursday-it's-almost-the-weekend to those who don't! I was actually a bit surprised to hear Janet say not to write a query like a dust jacket. She is actually the first person I heard say that is a bad thing. A dust jacket is meant to hook the reader. So, what makes it bad for a query? I kind of expected an elaboration in her hand-out since she was challenging a common statement, but alas, I did not see one. QOTKU, if you're reading this, can you explain further? Your handout for Effective Query Letters is outstanding. Thank you for making it publicly available! Laurie McLean said the same thing about not writing a query like dust jacket copy in her master class on query writing and pitches. The reason is many dust jackets are fairly generic. Read the copy on GAME OF THRONES for instance. It's so bland it could apply to any of a dozen books almost and certainly isn't enticing. A lot don't even mention the main character. The jacket copy on MISTBORN is backstory until the last line and finally gets around to mentioning the two main characters and then it still isn't by name. The editorial copy on Amazon is often better than the dust jacket copy according to McLean and I agree.